Wouldn’t you like to honestly tell your friends that you have royal blood in your family? You can if you adopt a greyhound. 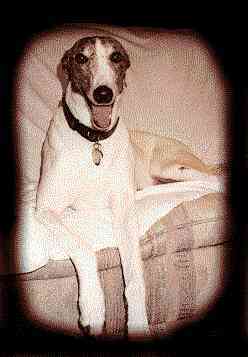 The Greyhound is as ancient as the desert from which he sprung. For thousands of years they were the dogs of choice by kings, queens, pharaohs, sheiks, and people of distinction. 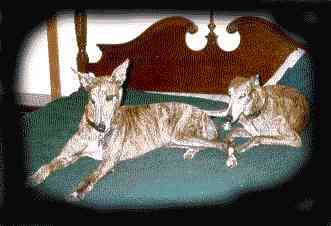 In early Arabian culture, the birth of a Greyhound was a cause for great celebration and second only to the birth of a son. They were the only dogs permitted to share an Arab’s tent or ride atop his camel. They were also the only dogs mentioned by name in the King James Version of the Bible (Proverbs 30:29-31). 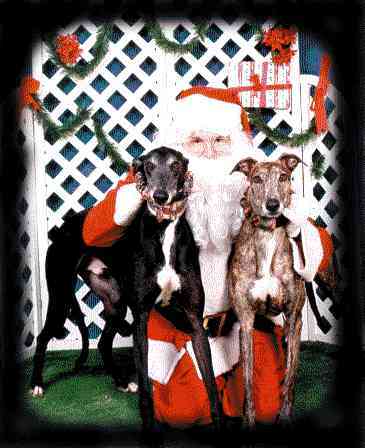 To be presented with a Greyhound was considered the most prized gift one could receive. 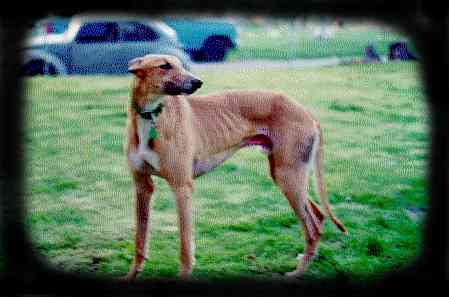 Persians believed that the Greyhound was permitted in the next world to give information and evidence about mankind. It was the Egyptians who first raced the Greyhounds for sport in open fields with a wild hare as quarry and no rules of the game except speed. 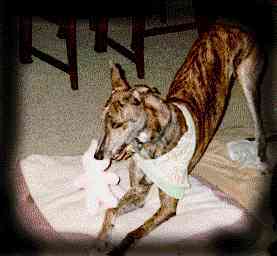 In the Early Kingdom, Greyhounds were considered to possess divine powers. During the 15th century, commoners were beheaded if caught with a Greyhound in their possession – so the sport of coursing (racing) could remain an elite activity shared only by nobility. When common men were finally allowed to own Greyhounds, their toes were broken so they could not be used for racing. 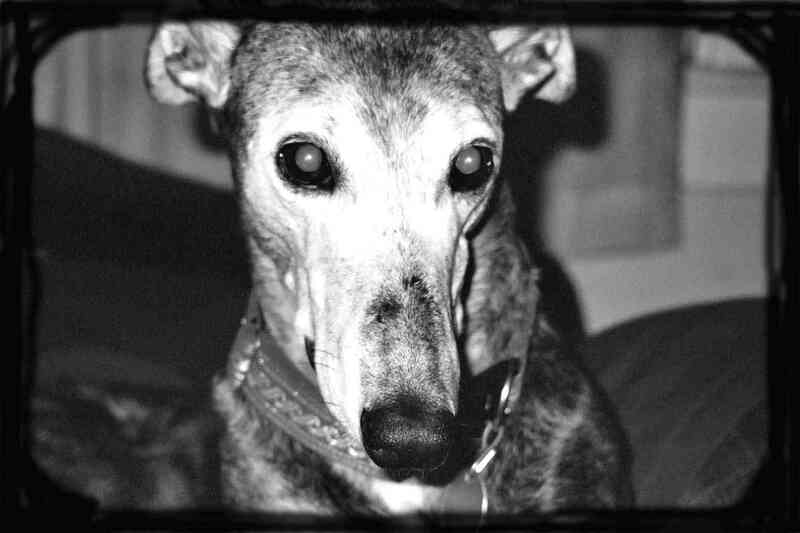 The destruction of a Greyhound was a serious crime. In the 16th century, Queen Elizabeth established the beginning of formalized dog racing, dubbed the “ Sport of Queens “. The first track to open in the United States was in California in 1920. 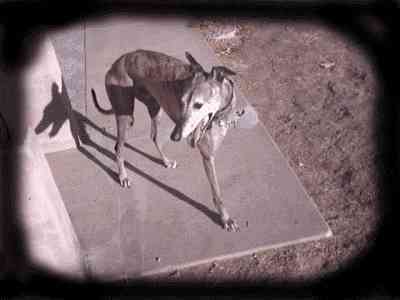 These fleet footed hounds are sight-hounds – they can spot a moving object up to half mile away. Their sprinting ability enables them to expend an enormous amount of energy in a short period of time. They run at their fastest between 40 to 45 miles per hour. Their ability to blend speed, coordination, and strategy has made them great hunters as well as racers. Like the forest of trees, Greyhounds are one of earths valued treasures. Please consider the following questions carefully. If in all honesty you have to answer “no” to one or more, adopting a greyhound wouldn’t be in the best interest for you or the dog right now. Am I willing to share my home with a greyhound? Greyhounds are house pets and people animals that should be exercised on the lead and only off the lead only in a total enclosed area. 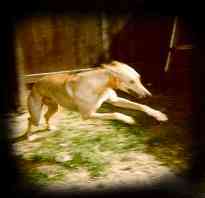 A greyhound is so quick that one allowed to roam free won’t live long especially if there is traffic near. 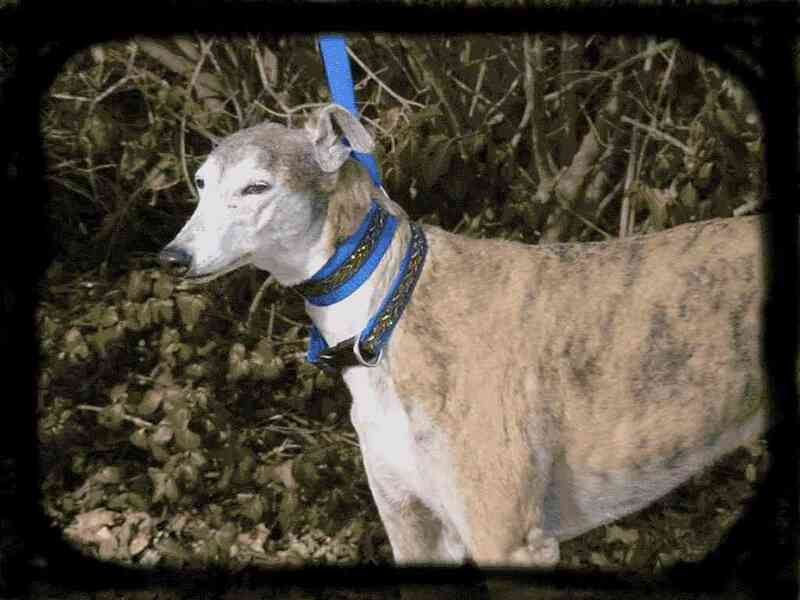 A greyhound must never be chained up or left neglected in a yard to be miserable, bored, and lonely. 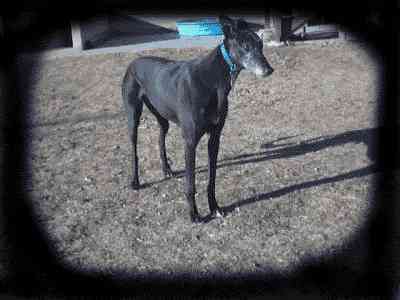 Do I have the time to explicitly follow instructions for helping a greyhound adjust to life in a new home? Greyhounds learn quickly, but they need you to teach them where to go to the bathroom, how to climb stairs, stay alone, get along with other pets, adjust to a new diet, etc. Am I a firm but gentle disciplinarian? 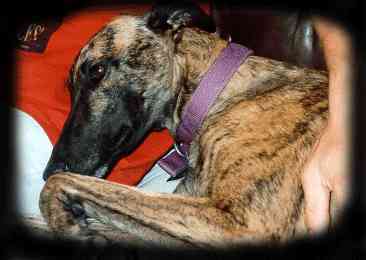 Greyhounds are very sensitive creatures that only want to please. They will not respond to a load voice or threatening manners. Violence will be fatal to your relationship. Any dog will make mistakes at first. Can you be patient with him? If you answered, “yes” to all these questions, you’ll have one of the smartest, most devoted pets that you will ever know. They are extremely clean, genetically, in terms of hereditary health problems. They are highly intelligent, intuitive, and loyal; they learn their new routines quickly. 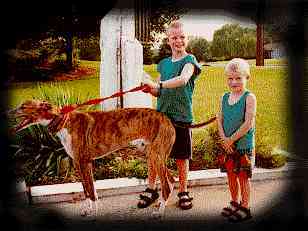 They are clean, easy to care for, and gentle; even a child can handle a Greyhound. They love and enjoy children and seniors, a wonderful companion and house pet for the whole family. They are young (between 18 months and five years of age), healthy, lead trained, and instantly bond to their new family. Their life expectancy is mid-teens (14 to 16 years of age). They don’t need any more exercise than any other breeds. A daily walk will do. They also make excellent jogging companions. They are very social and can learn to live with other pets in your family. They become watchdogs, but not attack dogs. They come in many colors and stand between 26 to 29 inches tall at the shoulder and weigh between 45 to 80 pounds. Retired racing Greyhounds make wonderful pets. Surprised! Have you ever gone to the dog track and seen only a long lean running machine attired in a racing jacket and muzzle? Perhaps you surmised, “They must wear those muzzles to sheath those teeth! And all that energy! 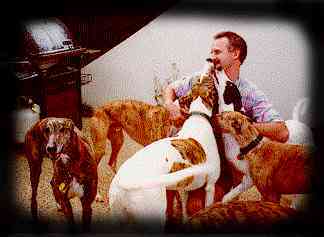 Racing greyhounds must need to run all day, every day just to calm down just a little!” Actually racing greyhounds wear a muzzle as a state requirement and used for photo finishes also all that energy because they are about to do want they were bred for – a quick sprint around the race track. 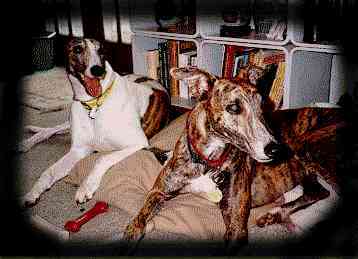 Unlike most sporting dogs, who were bred to run all day, greyhounds are capable of expending enormous amounts of energy in a few minutes; but after the race, it’s back to the business of kennel life: a drink of water, a turn in the exercise pen, three-day rest in the kennel before a chance to run again. 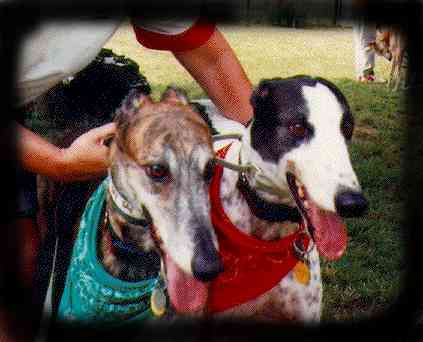 From their very beginnings, greyhounds have been bred to outrun it’s pray. Traditionally they were walked on a lead until game was sighted and then released. From that moment on, they pitted their grace and intelligence against that of their quarry. The necessity of making their own hunting decisions has made them self reliant and quick witted. Subsequently, the prestige of owning the fastest running dog led gentleman to race their dogs against each other, often with a substantial bet on the outcome. If, in the context of the race, a dog interfered in any way it was put down immediately. Centuries of this type of genetic selection have created a very peaceful dog. 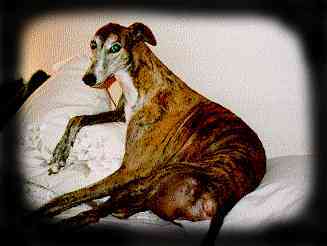 While many may think that the retired racer is not a good choice for the family dog, their long history says otherwise. They possess a calm and gentle nature and are easily walked on a leash by children. They do well in small houses, needing only their small spot for sleep and rest. 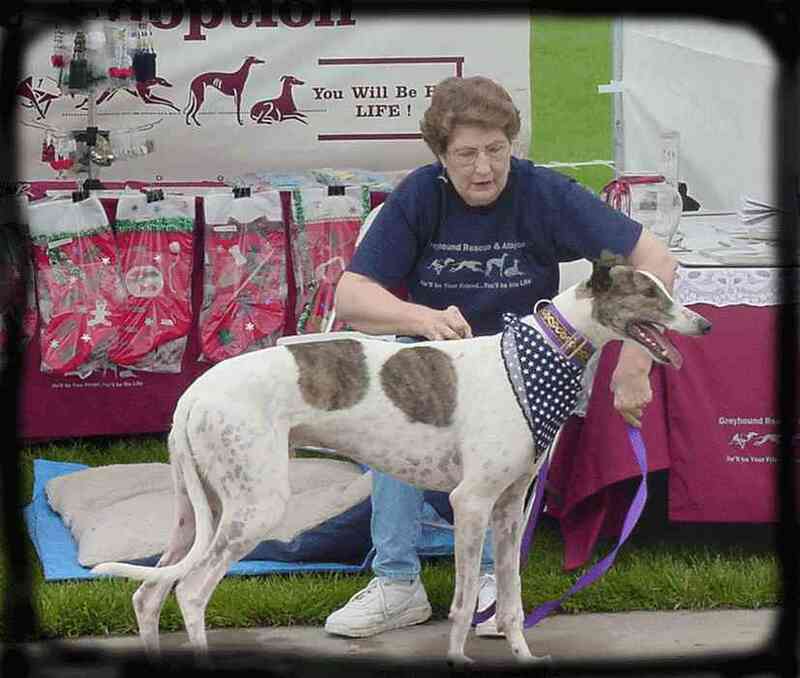 A walk once a day and an opportunity to run off leash once or twice a week in an enclosed ball field or park or park is all that they need as far as exercising a retired racer. (They should be given the opportunity to go outside four or five times a day to relieve themselves.) A more loyal and devoted companion you will not find anywhere. They are known as watch, but not guard, dogs. They are gentle and intelligent and not known for fits of barking. 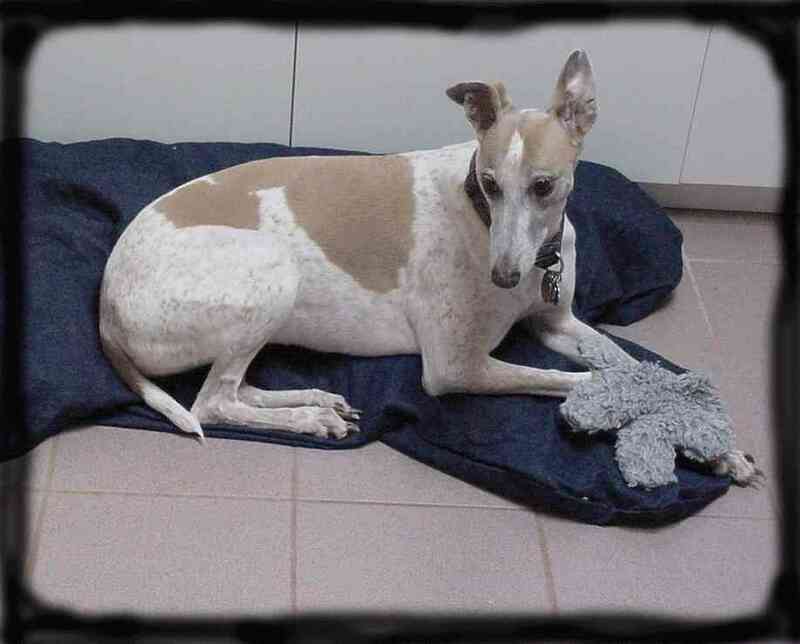 Recognizing the adjustment period and successfully managing it is a very important part of any greyhound adoption. 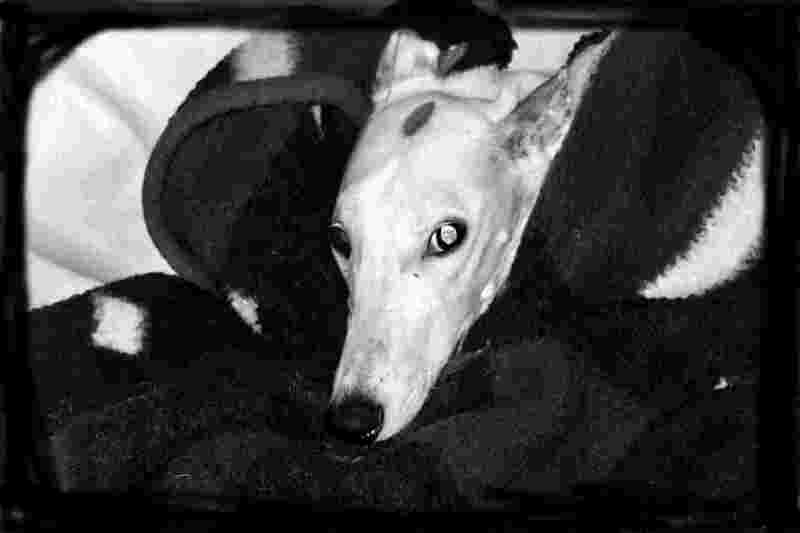 It must be remembered that becoming a pet involves a dramatic change in routine which can be stressful for a greyhound, and must be given time to adjust to his new surroundings. In this regard, a quiet greyhound may be fretful, a good eater reluctant to eat, a perfectly house broken greyhound may have an accident. Give your pet time to settle and don’t worry about any odd behavior during the first few weeks. Your love, patience, and understanding will help your greyhound through this adjustment period, which usually last from a few days to a few weeks. Greyhounds are friendly, affectionate dogs that thrive on attention and human companionship and make terrific pets once they get use to their new homes. 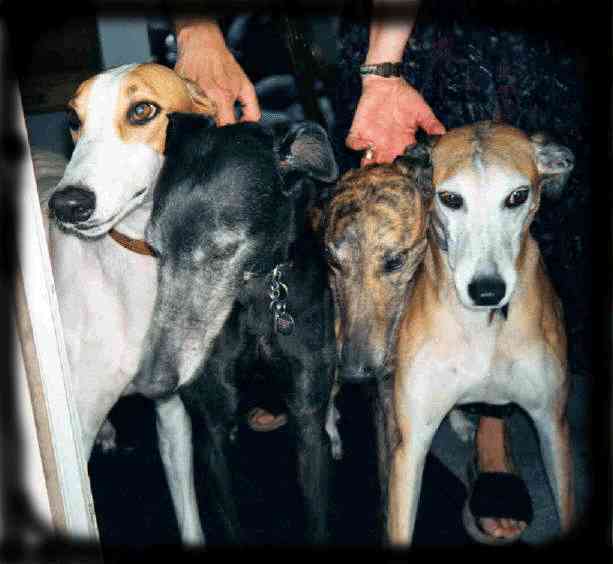 Raised with their littermates, where they competed for affection, greyhounds love becoming the center of attention as pets. Your greyhound has been housed in a large crate in his trainer’s kennel. He is used to being put outside in a fenced-in pen to relieve himself four times a day. He may be use to getting up early (about 5:00 am) to be taken outside. To avoid accidents in the house we recommend that you take him outside as soon as he gets up in the morning. You can gradually get him use to sleeping later. If your dog has an accident in the house, a verbal reprimand should usually suffice – then take him outside and praise him immediately when he relieves himself. ** DO NOT ** ever hit your dog or put his nose in “the accident” as your greyhound will respond more quickly and more positively to kindness. If your dog is a male, he may attempt to lift his leg in a few places around the house to “mark his territory”. Watch him carefully as he walks around the house and try to catch before he does it. If this should happen, it does not usually go on for long, so try to be patient. If your dog has an accident, clean the spot, then rinse the area with a solution of white vinegar and water. This will neutralize the odor and discourage his going in that spot again. For the first few days it is a good idea to go outside with your greyhound. This teaches him where his new home is and where he is suppose to “go”, helps relieve the tension of being in a strange place, and prevents accidents. You can praise him at the appropriate moment. Never ever confine your greyhound in a room by closing the door. He will very likely become frantic and do damage. 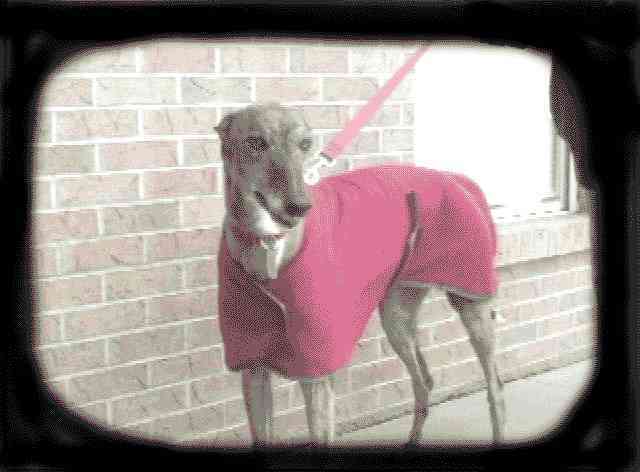 Greyhounds have been known to dig through closed doors. If you want to confine you dog to one room, use a baby gate. He will not climb over it and will feel less insecure. 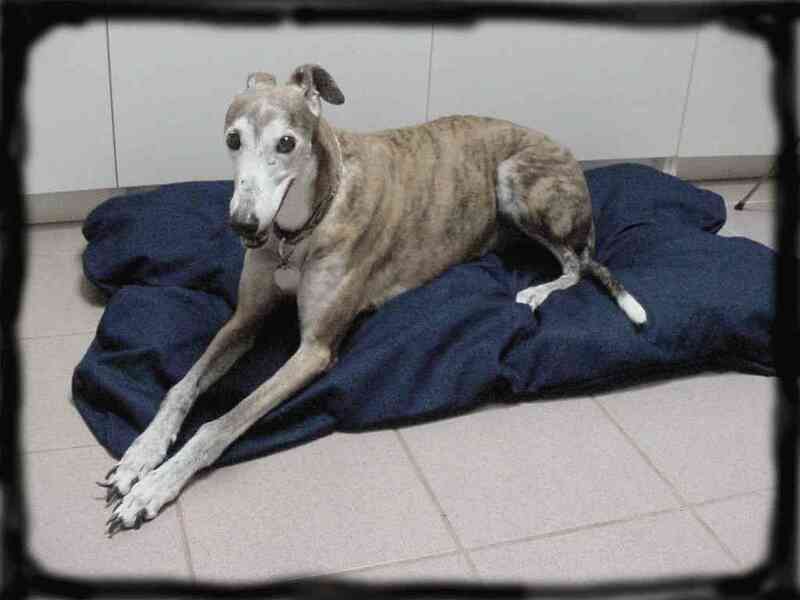 Provide your greyhound with the softest bed possible. 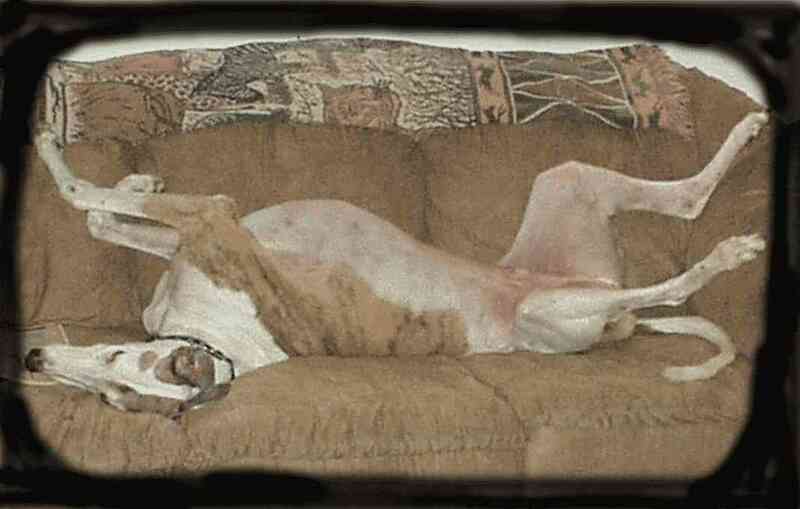 Greyhounds not only love the comfort, they require it. They have very little padding on their elbows and can develop a fluid condition if forced to sleep on a hard surface. You will be surprised at how quickly your greyhound becomes attached to you, and what a difference your presences makes to him. Do not shut your greyhound in another room to sleep – he would much prefer to sleep in the same room as you (in the same bed, if you let him!). He’ll feel more secure and less likely to cry or cause damage. 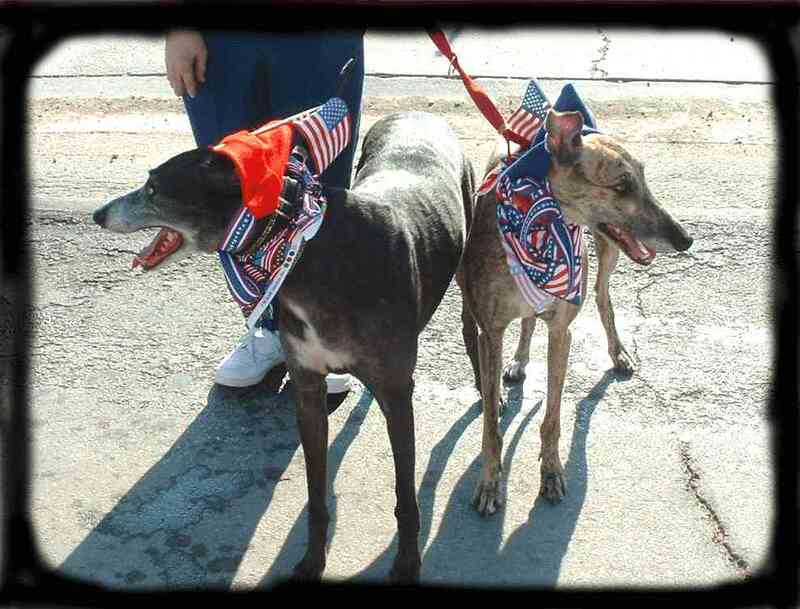 Your greyhound should get along fine with other dogs as he has had a lot of “socialization” experience in the racing kennel. 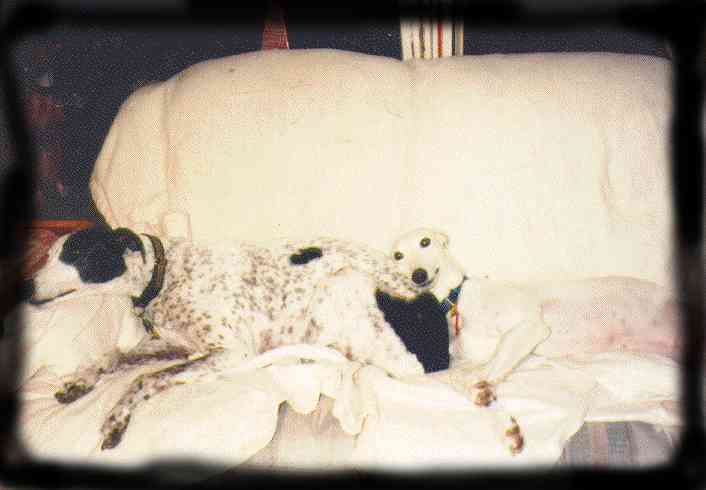 Take care, however, to watch them carefully at first, as the “original dog” may be jealous of the newcomer. Separate your dogs when you feed them, they can get very feisty over food. 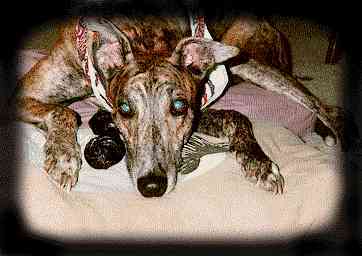 Greyhounds have always been left a little hungry and food is very important to them. It is not beneath a greyhound to try and steal another dog’s food. 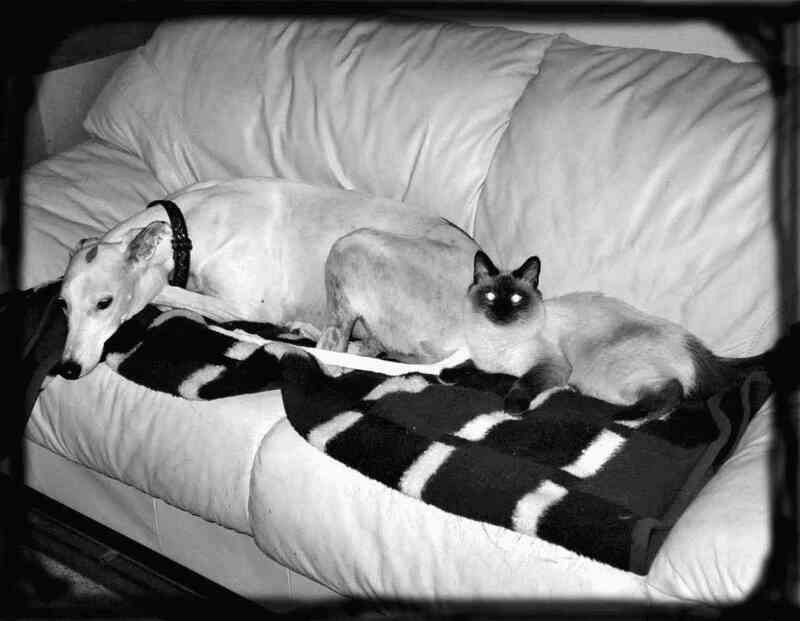 Many of our greyhounds live in homes with cats and get along well with them. They should, however, be introduced very carefully. 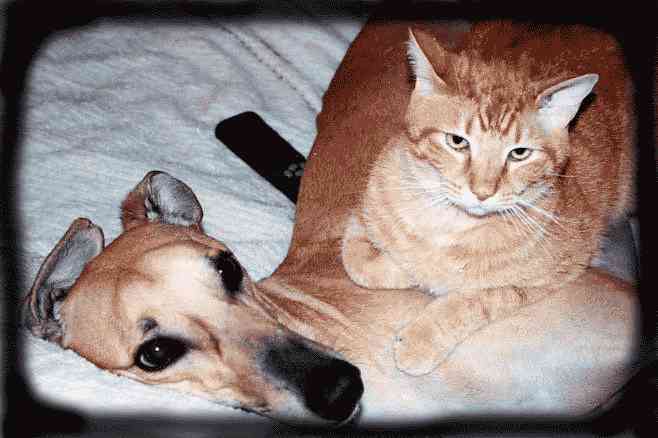 If you own a cat, your greyhound will have been “cat tested” prior to the adoption. 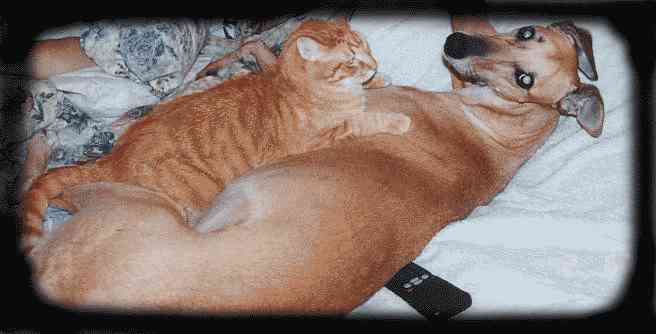 When first introducing your greyhound to your cat, have an adult hold the cat in their lap while a second adult leads the dog by his collar or lead to the cat. Allow the greyhound to sniff. Very likely the kitty will decide to leave after a sniff or two. That’s fine, but continue to hold on to the greyhound for a moment or two. Chasing the cat should not be allowed, even when they are playing. 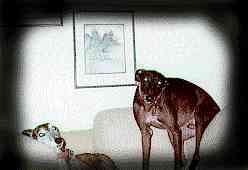 Also the greyhound may do just find with the cat in the house and will probably curl up and sleep together. Outside is another story, be very careful, your greyhound might or might not recognize his furry little friend as he is running across the yard and could chase him as a lure. 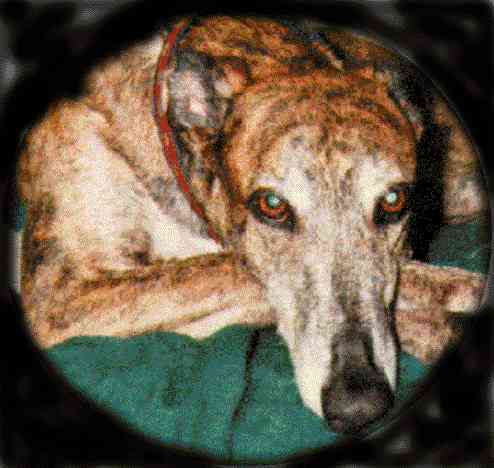 A cat safe greyhound mainly pertains to an inside cat not one that is outside. 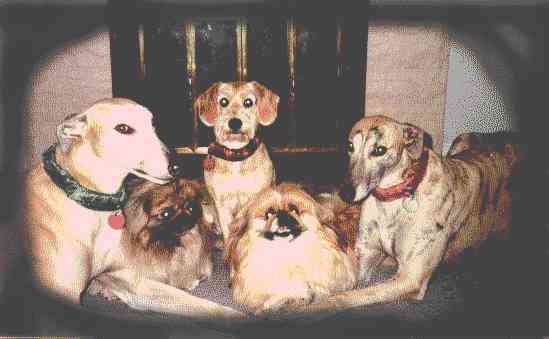 Remember these wonderful greyhounds are “Sighthounds”. Your greyhound has never had to go up or down a flight of stairs. He may find them intimidating at first. He will learn, but you must be patient with him. If you encounter a problem, start by carrying him almost to the top of the stairs. Then put him down and allow him to climb the last few steps. Gradually increase the number of steps he climbs. Reverse the procedure for downstairs. Do not push him – if frightened, he may try to jump all the way down the stairs. 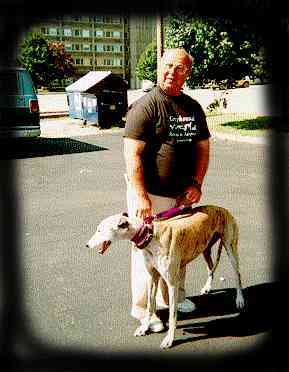 Your greyhound requires a lead (leash) with a heavy-duty clasp. His collar should be kept tight enough so that it won’t slip over his head if he backs up on his lead. 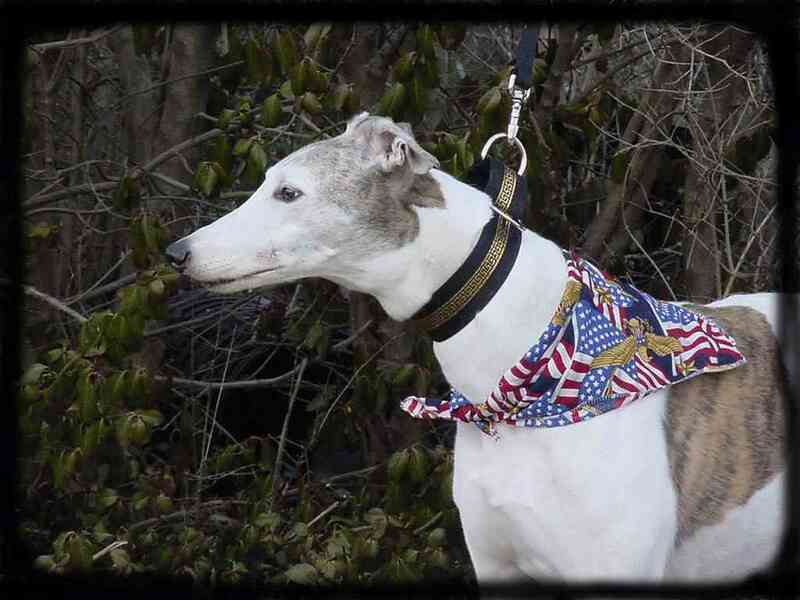 Using a martingale lead and a separate collar actually is the safest and most comfortable for the greyhound (see catalog section for these items). On his collar you will need to keep a current rabies vaccination tag and a personal ID tag with your name, address, and phone number on it. These must be kept on him at all times. 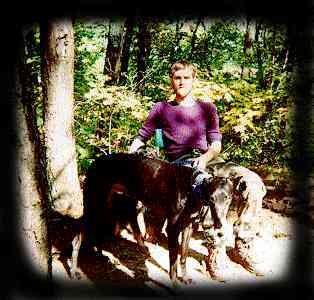 Never tie your greyhound outside on a rope, chain, or “runner”. Greyhounds are not use to being tied out, with such a great take-off speed the greyhound can horribly injure himself or it can even cause death. In retirement, a greyhound’s exercise needs are no different than any other dogs. 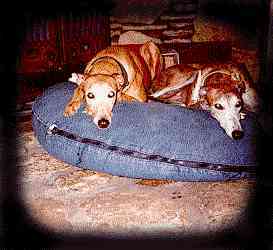 It helps during the initial adjustment period to keep the greyhound well exercised to work off his tension and nervous energy. 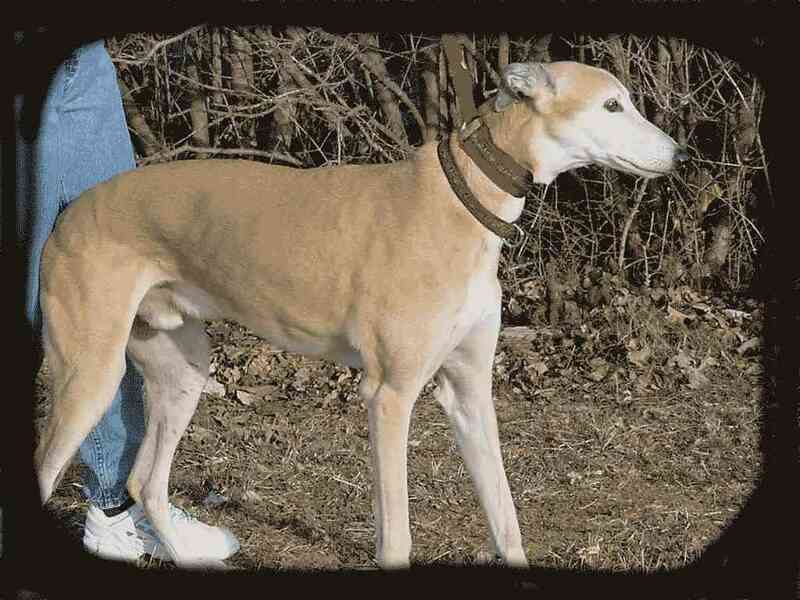 Greyhounds make excellent jogging companions once they learn and adjust to your stride. Summers heat and winter’s salt can injure his pads however; it would be comparable as if you would be running barefooted in these conditions. You just need to keep this in mind when you choose you’re a place to jog with your greyhound. If your greyhound does any strenuous running, give him a chance to relieve himself afterwards and again about an hour later to prevent kidney tie-up. Never take your greyhound outside a fenced area without his leash on. He will become confused and run away or he may chase a cat or other small animal. He does not know about traffic and if permitted off lead he is likely to run into the street and be hit by a car. 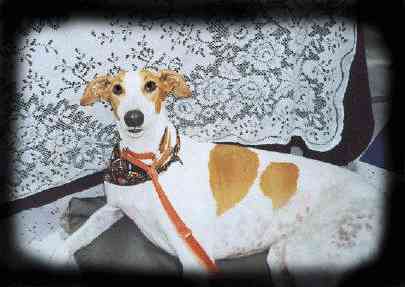 Your dog is a sighthound, which means he hunts by sight, not scent. He can see a small animal for a distance of a half-mile and he can run 45 miles per hour. If he sees the neighbor’s cat (or a squirrel or rabbit) in the distance, he will not only want to chase it, he will probably catch it. 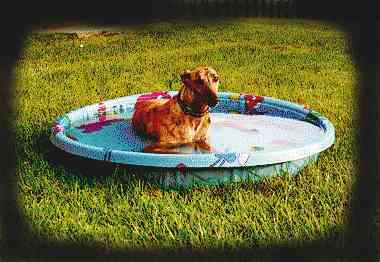 We also recommend feeding any large dog twice a day to prevent a serious condition called “bloat”. When you first get your greyhound you will want to put water on his food like you put milk on cereal for about a month till he settles in and then slowly wean it off. Dry is the best for their teeth but at first if you don’t put water on their food they will choke while eating. There are four points to grooming a dog: coat, ears, nails, and teeth. 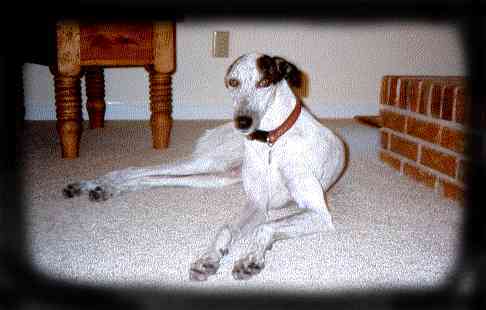 Greyhounds are shorthaired dogs that shed little if kept indoors. Frequent brushing will eliminate shedding. The outer ear can be cleaned with a cotton swab and mineral oil. Nails can be at your home or by your vet. It is very important that your greyhound’s teeth be kept clean, as plaque build-up will result in a gum infection. 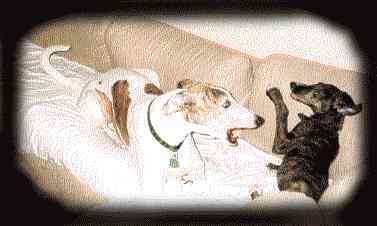 If plaque is built up on your greyhound’s teeth, have the teeth scaled by your vet. A professional should clean the teeth once a year. In between cleanings chew toy will help keep the dog’s teeth in better shape, also a small child’s toothbrush will do. 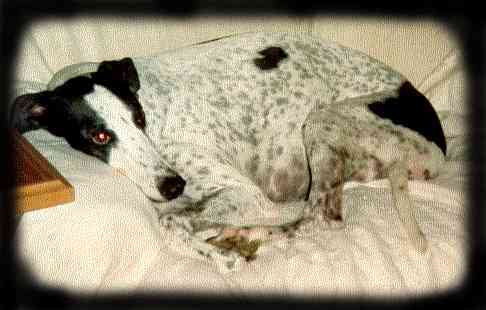 Even though Greyhounds are large dogs, they can curl up in a remarkable small space. 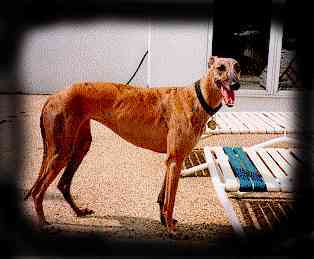 The retired racer has experienced several years of extensive training, at the cost of approximately $2000.00 per dog. 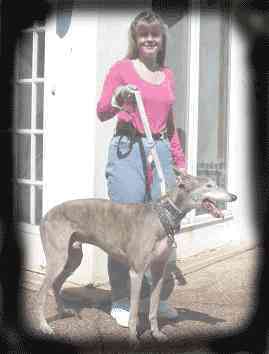 During the Greyhound’s complete stride, he is off the ground twice – a double suspension gallop. The Greyhound is a unique animal. He draws a crowd and is the center of attention where ever you take him. 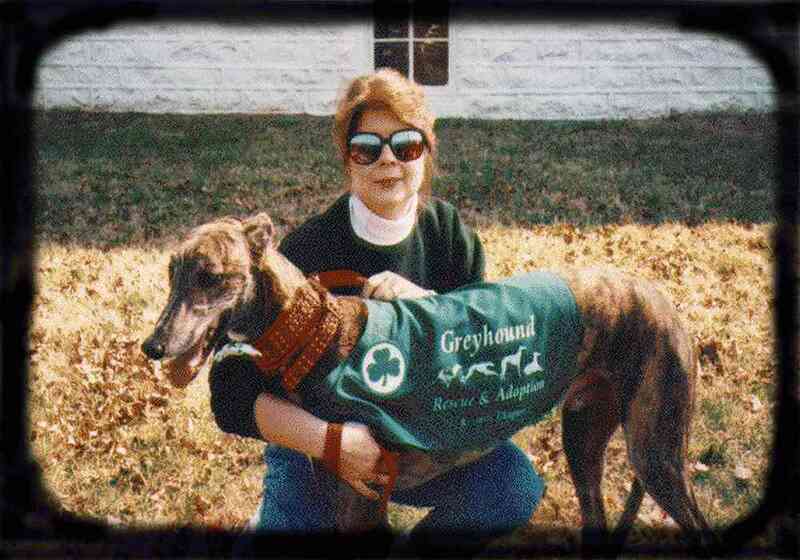 Some famous Greyhound fanciers were Cleopatra (the first lady of the Greyhound), Queen Elizabeth I, George Washington, Teddy Roosevelt, and General George Custer. 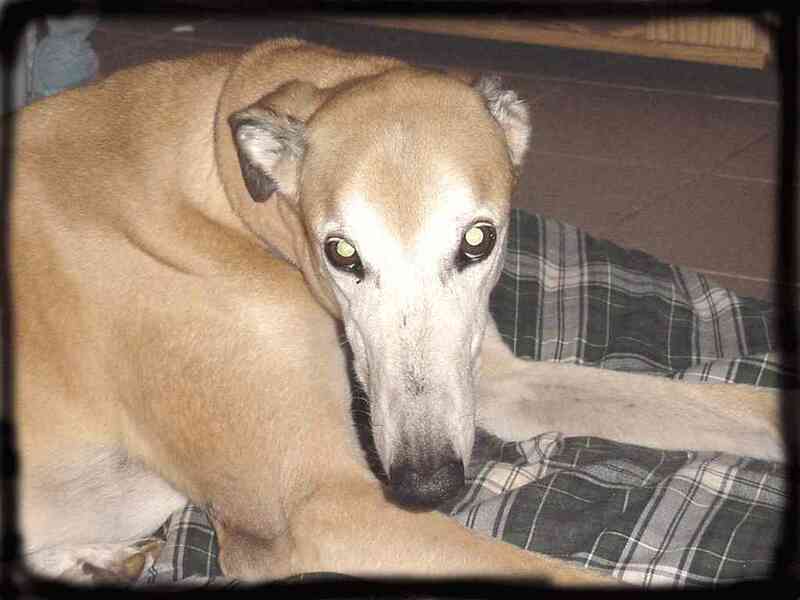 You’ll own a purebred Greyhound for just the cost of his medical protection.